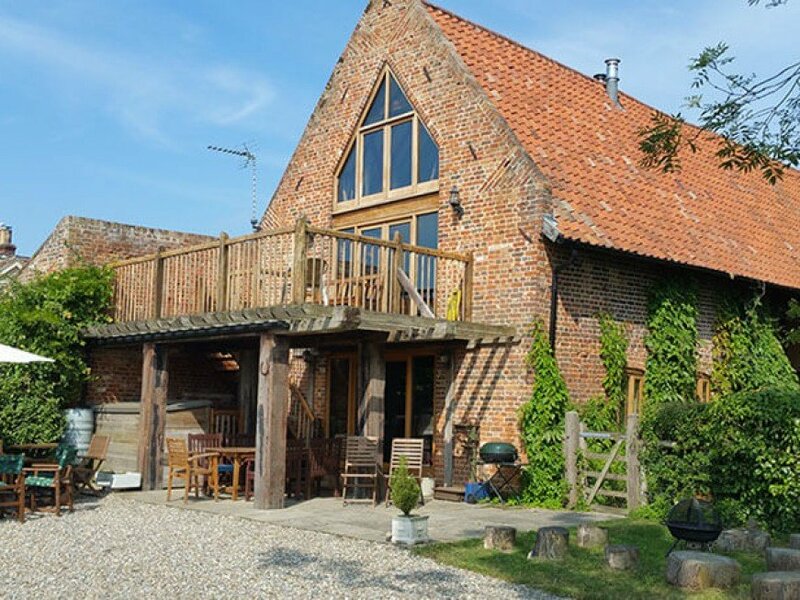 Beautiful 5-star award winning barn conversion sleeping 12. Perfect for groups, families and friends. The first thing you will notice when entering is the feeling of space. There is large galleried entrance hall with seating areas and adjoining cloakroom. There is a piano on the upstairs landing leading to the lounge areas. The first and second floor living rooms and lounge areas have panoramic views over Oulton marshes and beyond. These are west facing, with the lower lounge having a dining area and outside balcony offering the chance of viewing spectacular sunsets. The main lounge has large TV, Blu-ray DVD player and iPod/android audio docking station. On the ground floor is a spacious farmhouse kitchen, handmade by local tradesmen finished with granite worktops. The kitchen has a dining area seating 12 and sofas to relax. Through the patio doors is an outside terrace with covered seating area and views over the marshes. On three floors are four bedrooms, each with en suite facilities. On the ground floor there are two bedrooms, a luxury super king bedroom with en suite and a twin bedroom with en suite wet room. On the first floor, there are two family rooms. Each family room accommodates up to 4 people through two connecting rooms. The property is situated in an idyllic location the edge of Oulton Marsh nature reserve. Relax and take in the spectacular views and the wildlife. There is so much to see in this picturesque part of Suffolk. The River Waveney and the Broads only a short walk away while the fabulous beaches are only a ten-minute drive. The ground floor of the Barn has a spacious entrance hall with sofas and chairs and a working woodburner stairs lead up to the first floor gallery landing. The entrance hall also has access to a boot room and WC. The kitchen and dining area is also on the ground floor. The kitchen is fully equipped with double range oven, dishwasher and 50/50 fridge freezer. It is stocked with plates and dishes and cooking utensils to allow cooking for 12. The dining area has a table which seats 12, sofa and TV. There are also French doors leading out to the outside seating area and gardens. There are two bedrooms on the ground floor. Bedroom 1 has a king size bed and en suite bathroom. It also has a double wardrobe and chest of drawers. Bedroom 2 has two single beds and en suite shower room. Two double wardrobes and chest of drawers too. Note: The Barn has a utility area with washing machine and airing space which is shared with the other Barn annexes. The first floor has a gallery landing with piano overlooking the entrance hall. There is a lounge with sofa's and TV. A dining table that seats 6 overlooks the first floor balcony and the Suffolk Wildlife nature reserve. French doors lead onto and outside seating area which has unspoilt views across the marshes and splendid sunsets in the summer and autumn. The first floor give access to two separate family rooms – each separate family room comprises two rooms joined together by an internal staircase. Family Room 1 - has a single bed with another single bed which slides out from underneath making a twin room with en-suite bathroom - there are internal open plan stairs to a double bed in the attic bedroom. Family Room 2 - has a single bed with another single bed which slides out from underneath making a twin room with en-suite shower room - there are internal open plan stairs to a double bed in the attic bedroom. Internal stairs in the downstairs family rooms each lead to a separate double bedroom. The views from the Barn are unspoilt views of the Suffolk Wildlife Trust nature reserve and Oulton Marshes. Summer and autumn sunsets and winter frosts make it a magical place to stay.